Once again I spent time in the little fictional town of Magdalena. From the time I first read A Family Affair, I knew I would want to learn more about some of the characters - that one book couldn't be the end. Thankfully, author Mary Campisi felt the same way because she has gone on to publish multiple titles in the series, with six books published and a seventh title to be announced, as I write. A Family Affair: Spring was an enjoyable story and you can read my thoughts about it here but, as for now, I want to share with you a little about my thoughts of A Family Affair: Summer, the third book of the series. A little background: Daniel (aka Cash) had been a cop and Tess had dreamed of going into nursing, but Tess had a brother named JJ who skirted with the law and, sometimes, got himself into trouble. Enter Cash, a man who became a role model for JJ, a man who would fall in love with JJ's sister. The time came when Tess and Cash planned to get married. Three days before their wedding, the bottom dropped out of their world when Cash was called to the scene of a crime and, in self-defense, shot and killed the perpetrator, who turned out to be JJ. A moment of silence here while you stop to absorb the words of the preceding sentence, to try putting yourself into both Cash's and Tess' position, to determine how you might feel. The series of events and ensuing emotions which followed divided the town as one half of the town took Tess' side and the other half took Cash's. In the end, the two parted company - unable to live with the consequences of that night. 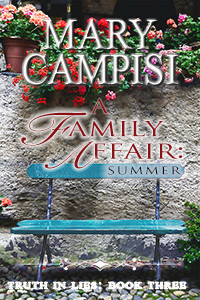 I knew this before reading A Family Affair: Summer, which shares the story of what happens eight years later. I caught up with a disheartened Tess who was doing everything she could to distance herself from the thoughts and feelings she experienced in the past. Meanwhile, Cash was shot while on duty and sent home to recuperate from his injuries. After a surprise visit by a resident of Magdalena - not to mention a blackmail attempt -Tess heads back home to try to bring Cash out of the world of misery he can't seem to escape. Campisi did a wonder job of bringing the emotions to the surface when the two saw each other face-to-face for the first time in eight years. We could feel the love each continued to have for the other, but knew they were both hurting and struggling over past heartaches. It was a pleasure getting to know these two and, like the various residents of Magdalena, I was hoping the two would reunite and, possibly, find their happily ever after - but, as in life, something often comes along to stand in the way of happiness. The question I will leave you with is this: will Tess and Cash be able to overcome the new obstacles in their path or will the past repeat itself, sending each into a sea of loneliness again? You could purchase A Family Affair: Summer at Amazon, or even read the reviews to see what others have had to say but, personally, I'd recommend starting at the beginning and reading your way through the series. Note: Click on either cover below to be taken to the book's page on Amazon. The books are listed in the order they have been published. Enjoy!